Walking the streets of a highly-populated city, or even a crowded event for that matter, comes with certain risks like pickpocketing. Mindful of this, Maker TVMiller has come up with a clever system to prevent bag thieves from unknowingly creeping up behind you. 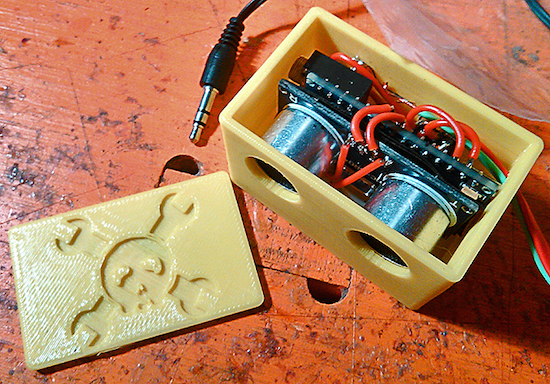 Called the “Arduino MetroPhones,” the device consists of a Nano, an ultrasonic sensor, a digital potentiometer, a coin-cell battery, and a few other components, all housed inside a 3D-printed case. The metropolitan in its natural habitat; unaware, oblivious, purposefully deafened and subsequent prey. To increase perception thus safety, we wed an Arduino Nano and ultrasonic sensor to regulate volume to proximity to someone behind you; easily deactivated per environment and rechargeable. Beyond this proof of concept, intention for apparel or accessory (purse, back pack) embedding is ideal. This prototype of a prototype is a mono-version. A stereo version would merely require dual channels. Thus, imagine, you plug your head phones in to your purse strap which is embedded with a MetroPhone with Bluetooth that streams to your smartphone..